On Christmas Eve, 1968, humans reached the Moon for the first time. For 20 hours, the Apollo 8 astronauts orbited our nearest neighbor, alone in the vastness of space. The flight marked many milestones, from the first crewed launch of the giant Saturn V rocket to the famous live television broadcast from lunar orbit, which saw three astronauts reading from the Book of Genesis to one billion people back on Earth. But the most enduring impact of the mission, and perhaps of the entire Apollo program, was an unexpected photograph. On the outward leg of the journey, Earth receded until it could be covered by an astronaut’s thumb held at arm’s length. As their spacecraft came around the far side of the Moon, a scene – ancient and new – greeted the crew: a gibbous Earth, rising over the lunar horizon. Beginning with that first voyage to another world, life on Earth has been the ultimate focus of, impetus for, and guiding principle behind, all space exploration. Why do we explore? What do we hope to gain? What waits for us on the Moon, on Mars, and beyond? The answer was, is, and always will be found here at home. When President Kennedy first set our country on its course to the Moon in 1961, he didn’t position it as a matter of science or technology. He didn’t appeal to our spirit of exploration. He presented the challenge in purely earthly terms; developing U.S. space capabilities was about geopolitics – a response to the Soviet Union’s stunning achievement of the first human spaceflight only six weeks earlier. Our first emissaries to the stars were soldiers and sailors, riding atop repurposed weapons of war in a race to the Moon that served as an ostensibly peaceful analogue to nuclear chess. Our early astronauts were also some of our most important diplomats. Beginning with an encounter between astronaut John Glenn and cosmonaut Gherman Titov in 1962, in official meetings and tête-à-têtes, rival spacefarers created momentary amity between two superpowers. After all, who could understand the pressures of being an astronaut if not a cosmonaut? 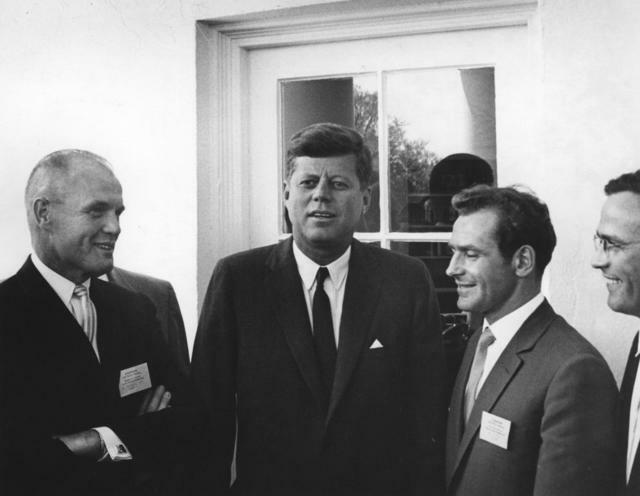 President John F. Kennedy speaks with John Glenn (left) and Gherman Titov (right) at the White House on May 3, 1962. Apollo 8 Commander Frank Borman famously viewed outer space as the ultimate battlefield of the Cold War, and often said that he went to the Moon for only one reason: to beat the Soviet Union. But following his historic mission, and weeks before the launch of Apollo 11, Borman was invited to tour the arch rival’s home turf, where he enjoyed a hero’s welcome. Later, the archetypical steely-eyed missile man would write, "I like to think that President Nixon and Secretary Kissinger were interested in using space as a means of détente. I know we advanced that agenda – we started the process of ending the Cold War." The last Apollo spacecraft launched in 1975, bound not for the Moon, but for orbital rendezvous with a Soyuz capsule in the first joint U.S.-Soviet spaceflight. Eighteen years after Sputnik circled the globe, a moment that sparked a geopolitical scramble for the skies, astronauts and cosmonauts broke bread together in Earth orbit. 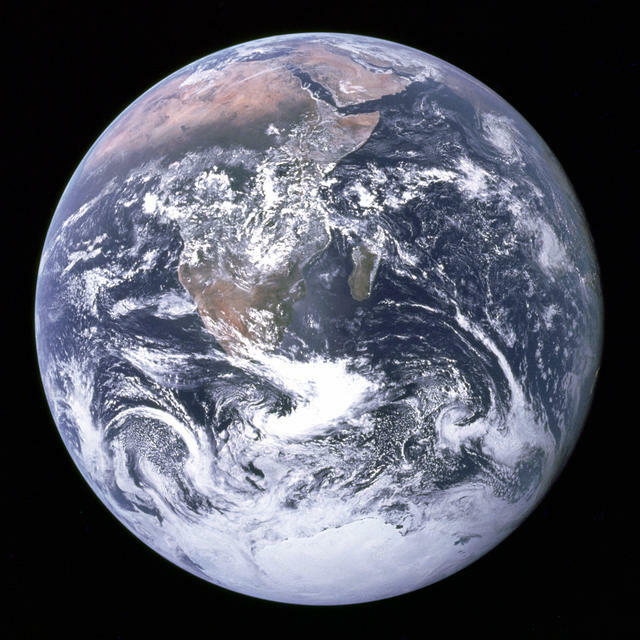 The children of the Apollo era had grown up with a new vocabulary for achievement: “the right stuff,” “moonshots,” and “giant leaps.” But in the years to come, we turned our attention back toward our own “blue marble,” as another iconic image nicknamed our planet. Low Earth orbit – 99 to 1,200 miles above Earth’s surface – experienced a frontier-style innovation boom. The U.S. and Soviet Union launched crewed space stations, and new constellations of satellites began orbiting our planet. This provided unprecedented benefits back home in communications, navigation, and climate and environmental science. From agriculture to transoceanic shipping, and from long-distance telephone service to MTV, advances in space made life on Earth safer, richer, and more interconnected. When it comes to the many and varied uses of space technology here on Earth, we’ve seen time and again that investments up there provide benefits down here. One of my favorite photos from space shows not our entire planet, but a tiny fraction of it: the Virunga volcano chain along the borders of Rwanda, the former Zaire, and Uganda. The false-color composite was taken in 1994 by an instrument aboard the Shuttle Endeavour called Spaceborne Imaging Radar-C, or SIR-C. It had been designed to map complex Earth features from orbit, and, notably, could take images regardless of cloud cover. This prompted researchers from Rutgers University and the Dian Fossey Gorilla Fund to request NASA’s help in studying dwindling vegetation in the habitat of critically endangered mountain gorillas, whose homes are famously shrouded in mist. The multi-hued image, with the colors representing different types of vegetation, exemplifies the unique potential of spaceflight to benefit life on the ground, even for the most terrestrial of Earth’s creatures. The photos helped experts create a virtual three-dimension reconstruction of the habitat, which they used to plot the gorillas’ movements and track poaching and other impactful human activities in the region. When it comes to the many and varied uses of space technology here on Earth, we’ve seen time and again that investments up there provide benefits down here. In the agriculture industry, farmers can operate self-driving tractors using signals from GPS satellites and can predict crop yields using technology supported by satellite imagery. Scientists have used satellites to monitor Florida’s red-tide algae blooms. Space also plays a major role in a field of particular importance to me: climate science. NASA has more than a dozen satellites orbiting the planet that study the oceans, land, ice, the atmosphere, and the biosphere – producing observations that are paramount to understanding how and why our climate is changing and what we can do to protect our planet. My generation grew up with Mars seemingly within our grasp, even from 34 million miles away. I started down the path of becoming a planetary scientist after hearing Carl Sagan speak about the tantalizing possibility that evidence of life might be there, waiting for us to turn over the right rock. Little did I dream then that I would go on to work as NASA’s chief scientist on the development of a long-range plan to send humans to Mars. That century-defining moment, like its 20th-century predecessor, will drive human innovation further and inspire generations to dream bigger. Much like we saw with the Apollo program, it is sure to result in new technologies and new understanding to apply on Earth. We have the technology and we understand the biology. We know where to look and we know how to test. Within our lifetimes, we will find life beyond Earth. As we explore further, similarities to, and differences from, our celestial neighbors give us a critical frame of reference. The knowledge that planets and moons throughout the solar system have undergone extensive meteorite bombardment in the past has driven new understanding of Earth’s geologic history, where impact sites, largely erased by erosion, plate tectonics, and volcanism, are not as apparent. We can also study the dust storms of Mars to better understand the impact of dust in our own air. We can study atmospheres with abundant carbon dioxide, like those of Mars and Venus, to predict the impact of carbon dioxide on Earth. The more information we can gather, the better we are able to grasp our home planet’s dynamics, both commonplace and unusual. However, there is a discovery on the horizon that I consider more fundamentally important to understanding the universe and our place in it. As humans explore our neighboring planets, robotic missions will be probing the icy moons of the outer solar system. Somewhere in the briny subsurface oceans of Europa or Enceladus, or even in the windswept hydrocarbon seas of Titan, awaits evidence of life. Whether we find signs of past or present life on Mars or there, on a moon of Jupiter or Saturn – even if it is just a single-celled organism – it will allow us to become more optimistic about the ubiquity of life in the universe. We have the technology and we understand the biology. We know where to look and we know how to test. Within our lifetimes, we will find life beyond Earth. Human history is a timeline of exploration and migration, and we have looked to space in that context, too. While humans have yet to venture beyond our nearest celestial neighbor, our eyes and ears are continuing to stretch across the solar system. There have been X-ray spectrometers on Mars, a gas chromatograph on Titan, and even magnetometers operating in the interstellar medium. For 127 minutes in 1982, we had microphones recording the sound of the wind on the surface of Venus before they fell to the planet’s extreme environment. It is cameras, however, that remain by far the most important instruments we have sent into space. Ground-based observatories and Earth-observing satellites, the Hubble Space Telescope, and soon, the James Webb Space Telescope, bring us the wonders of the universe and give us a glimpse of the stunning cosmic setting in which we find our oasis-home. 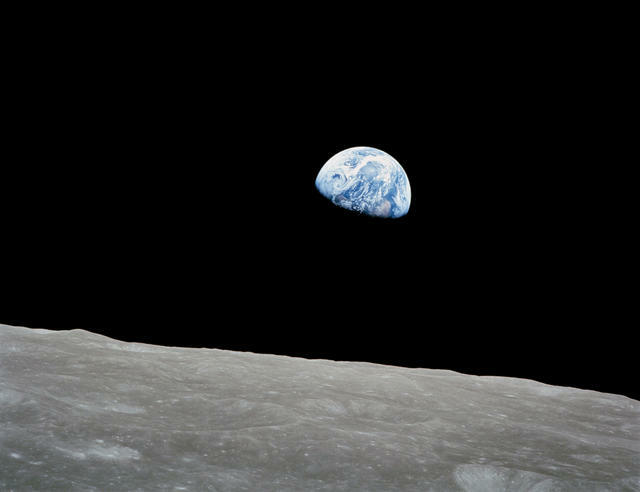 If Earthrise and Blue Marble showed us how special our planet truly is, with stunning blue oceans and swirling white clouds, cradling the only (currently) known life in the cosmos, another famous photograph – Pale Blue Dot – drives home a shocking parallel truth: our isolation. 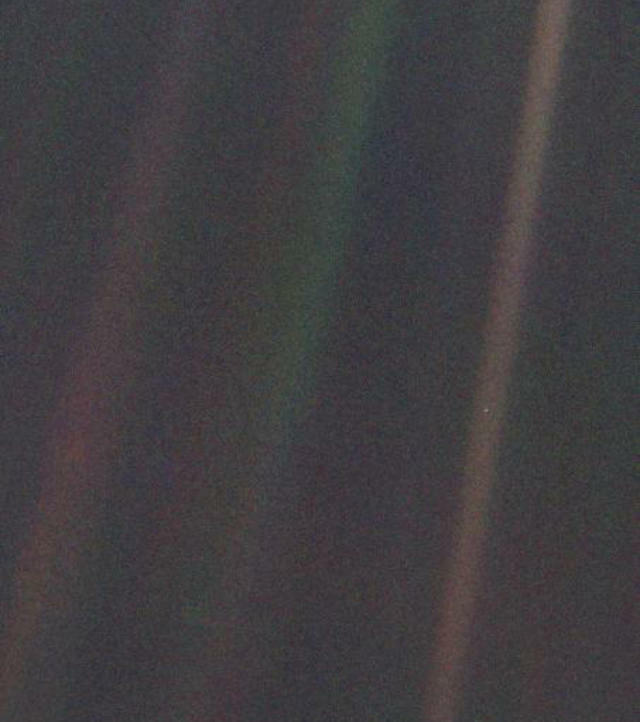 "Earth is a mere point of light, less than the size of a picture element even in the narrow-angle camera," says NASA's website in describing *Pale Blue Dot*. "Coincidentally, Earth lies right in the center of one of the scattered light rays resulting from taking the image so close to the sun." Will we follow the necessary path to drastically reduce our dependence on fossil fuels in order to turn the tide on climate change – and keep our pale blue dot habitable? Sagan foresaw the human impact of Pale Blue Dot when he conceived it more than a decade before the photo was ultimately taken. It had very little scientific value, he conceded, but reasoned that the unknown is only one reason we are explorers; we also seek to know ourselves and our place, where we come from and where we are going, to organize and measure ourselves against seemingly impossible goals. A photo of Earth from three billion miles away may have little to tell us about laws of nature, but may say something profound about the nature of humanity. And humanity’s vulnerability. The uncomfortable truth voiced by Sagan 25 years ago – “the Earth is where we make our stand” – takes on particular relevance right now. The extensive 60-year record of Earth science data collected by NASA, combined with our deep knowledge of Earth’s past climate and our understanding of the climates of other planets, shows that we are at a critical point. Will we follow the necessary path to drastically reduce our dependence on fossil fuels in order to turn the tide on climate change – and keep our pale blue dot habitable? Others have sought to build upon the legacy of this and previous photos of Earth from space. My friend, Carolyn Porco, head of the imaging team for the Cassini mission to Saturn, envisioned another “global moment of cosmic self-awareness.” Like Voyager 1, Cassini had years of stunning scientific discoveries behind it when Earth sent the command to turn its camera homeward. Unlike the case of Pale Blue Dot, however, the people of Earth knew where to look. This panoramic mosaic of the Saturn system, spanning nearly 405,000 miles across, includes a pinprick-sized, self-aware Earth in the lower right. On July 19, 2013, people all over the Western Hemisphere went outside, turned east, and waved into the bright blue sky. It was the first time that humans knew in advance that their planet was being imaged. The result shows Earth as it is: tiny, inconceivably dwarfed by the scale of the universe and the grandeur of the outer planets. Of course, none of the waving hands are visible from 898 million miles away, but the photo does shows us as we are, in a sense: curious, aware, looking out into the cosmos, and looking for ourselves. Ellen Stofan (@EllenStofan) is the John and Adrienne Mars Director of the Smithsonian’s National Air and Space Museum. She was previously chief scientist at NASA. An advocate for diversity in STEAM fields, she also worked on missions exploring Venus, Earth, Mars, and Saturn at NASA’s Jet Propulsion Laboratory.